Here is a useful list of 100+ companies supplying heirloom / non-GMO / organic seeds. If health is wealth, then this page is solid gold! Please share this important information. If you have any additions or corrections for this list, please let us know! We welcome genuine suppliers based anywhere in the world. Let’s make the biggest and best list we can! Recommendations for more heirloom seed companies to add have been pouring in. 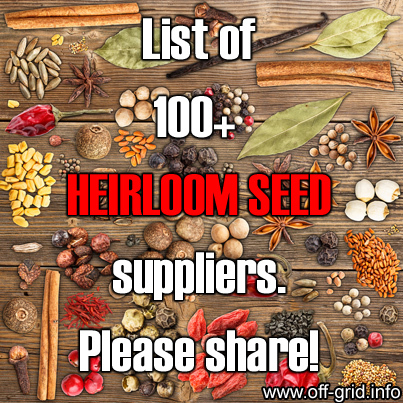 We started with 40 but now have over 100 heirloom seed suppliers,….and the sheer diversity of undiscovered plant varieties we now link to is turning this page into a real treasure trove! Please continue to send more heirloom / organic / non-GMO seed suppliers to , we are gathering them up and will add them to this page very shortly. Thanks so much to all for your contributions and for spreading the word!